Can you cook these campfire foods in your BBQ grill as well? What do you use to light your campfire when cooking over it? When it comes to finding the best camping recipes, there are a ton of great camping recipes to consider. No matter if you’re looking for desserts or main meals, these options should give you all you need to make your next camping trip full of delicious food! One of the best parts of camping is to be able to relax by the fire and eat some delicious food. When it comes to finding camping recipes that are certain to treat your taste buds, you will absolutely find one (or many) that you like here! Plan ahead for your next camping trip and make out your meal plan menu. 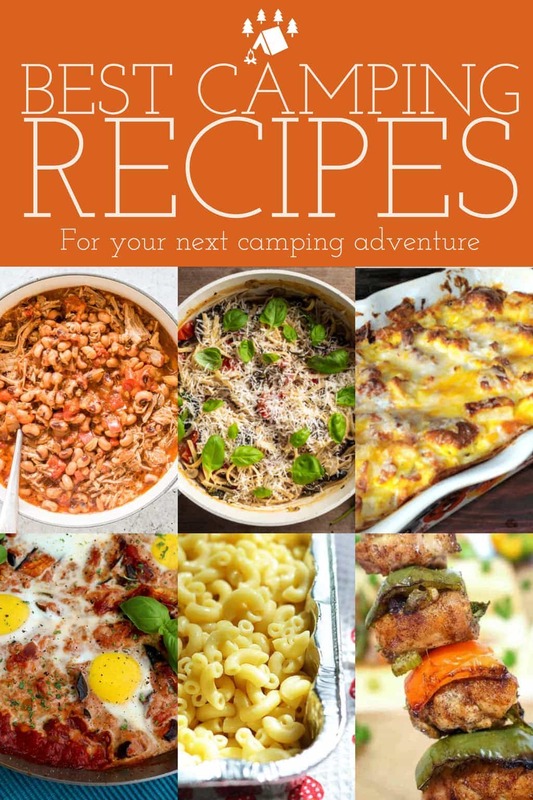 These delicious camping recipes will fill everyone’s tummy and have plenty left over to share! Have fun choosing our your favorite camping foods from these options! These are some of the best there are! Talk about some amazing campfire foods! Many of these recipes can actually be cooked in your BBQ Camping Grill as well if you’re camping somewhere that there isn’t a campfire ring. Just make certain that you keep a close eye on the food that you’re cooking to ensure that you’re not letting it get too hot or burn. Great question! You want to be certain that you’re using items that are safe to cook over and eat. If you’re lighting your campfire with chemicals, think about the possibility of that being in the air around your campfire and your food. There are firestarters that are “food-safe” that you can purchase if you need something to help you start your campfire. Otherwise, using firewood or even charcoal are all great ways to light your campfire to then use for cooking. There you have it! Therese campfire recipes are some of the best and most unique recipes that you’ll find! Not only are they all different, but they are all delicious as well. Light up that campfire the moment that you arrive and get ready to treat yourself to some glorious tastes of food while camping! Do you have a favorite campfire food to take and cook when camping?